Blake Baggett was all smiles on the podium in Glendale and in the press conference after winning his first 450 Supercross main. 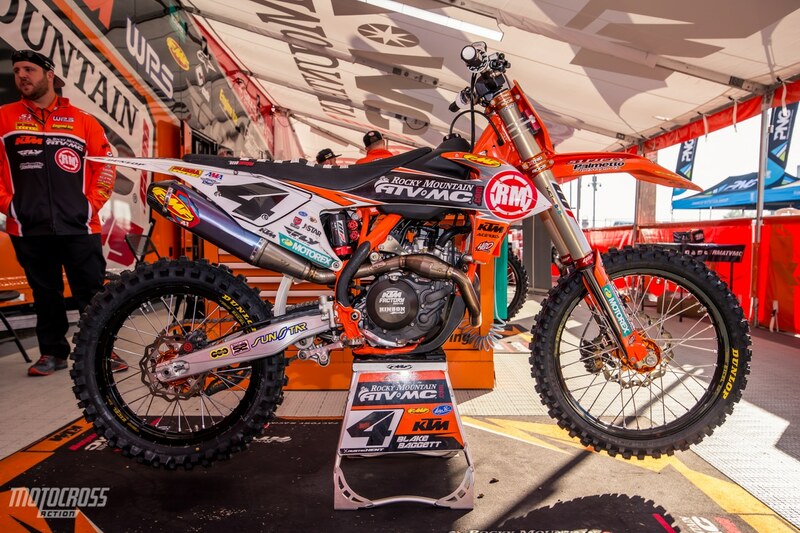 Although the Rocky Mountain ATV/MC-KTM-WPS rider Blake Baggett has been on the 450 Supercross podium several times, he may not have been at the top of everyone’s list to win this past weekend’s Glendale Supercross. 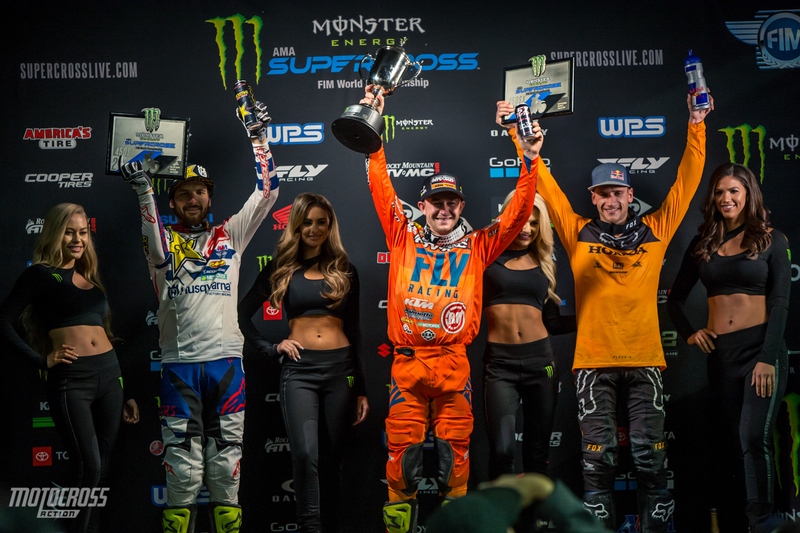 Still it’s not a total shocker as he has won 250 Supercross rounds in the past. At Glendale Blake was in fourth, then third, and then second before passing leader Jason Anderson by taking the outside line into a turn. From that point on, the soon to be 27-year-old simply checked out! 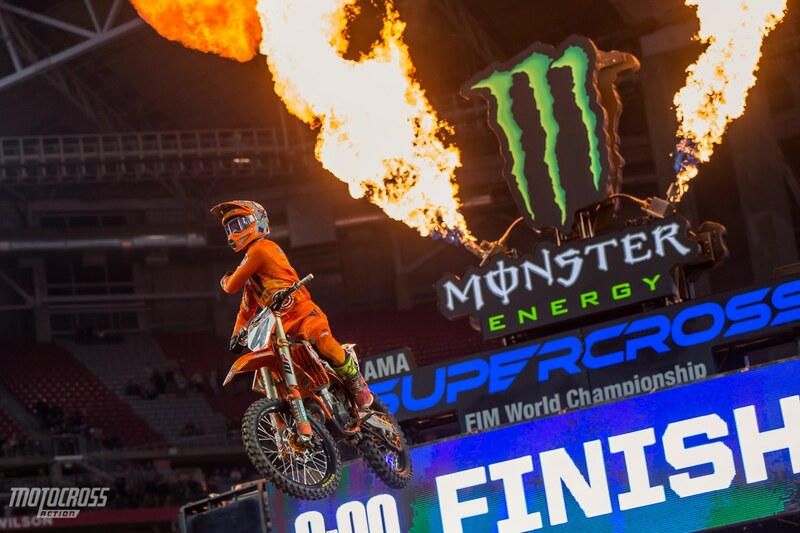 Not only was this his first 450 Supercross win, it was his team’s first Supercross win as well! Now fourth in championship standings, Blake is only seven points out of first. It was after the post race press conference when the El Chupacabra took a few minutes to talk to us. 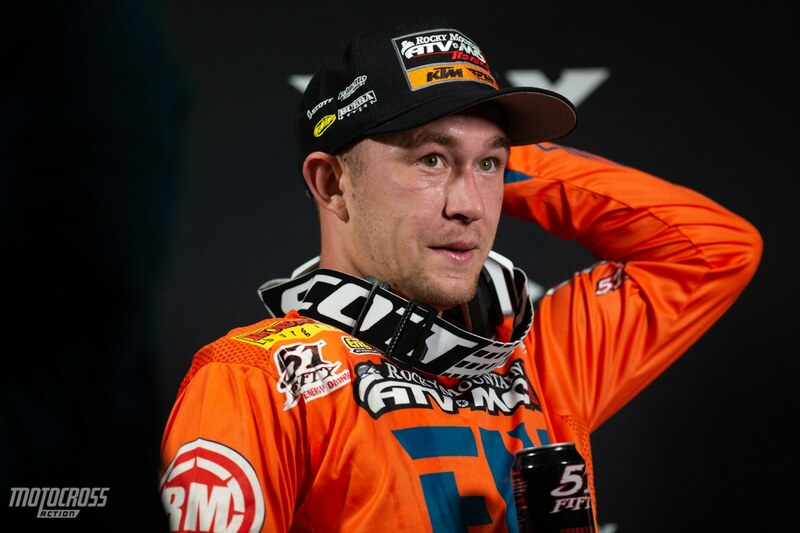 Blake Baggett already has his focus set on Anaheim 2. BLAKE, YOU SEEM PRETTY CALM AFTER TAKING YOUR FIRST 450 WIN. You know, it is already over. They already took the pictures, and I already held the trophy. You know, it is a long series, we are only on round two and there are fifteen rounds to go. So, it is time to just worry about next weekend and what we have to do there. It is a pretty big salvage from last weekend where our race was terrible. I rode terribly, and to salvage this (with a win), you cannot salvage it out any better than this. Now, it is just time to put it back up front, every time, so that we are there for the end and the championship. The Arizona crowd roared when Blake made the pass for the lead and claimed his first win. YOU PASSED JASON ANDERSON AND THEN GAPPED HIM, CAN YOU TOUCH ON THAT? The track was just deteriorating quick, and everything that was already slick was getting slicker. The whoops were just walking around on us. By that I mean the front wheel was not getting traction. Normally the rear wheel is what walks around on you. It was one of those things were if you did not have your feet exactly on the pegs, the front wheel was starting to push out, and it felt like someone was pulling the spokes out from underneath you. So, it was one of those things where the track was just going away. I was able to find a few little edges, and a few little curves out there that I was able to turn off of, or move and use to get some more traction, but it was just a fight for traction really. Blake’s bike was ready to go on the slick Arizona track. IT LOOKED TO ME LIKE YOU WERE ESPECIALLY QUICK IN THAT LONG RHYTHM SECTION, CLOSEST TO THE SEATS IN THE STADIUM. I don’t remember it, in fact right now I could not tell you the layout of the track. Those final minutes were happening so fast, but then it was like it was in slow motion during the last five laps. So just trying to race the track, keeping the thing up on two wheels, but getting everything you could out of it. As I said the traction was tough. 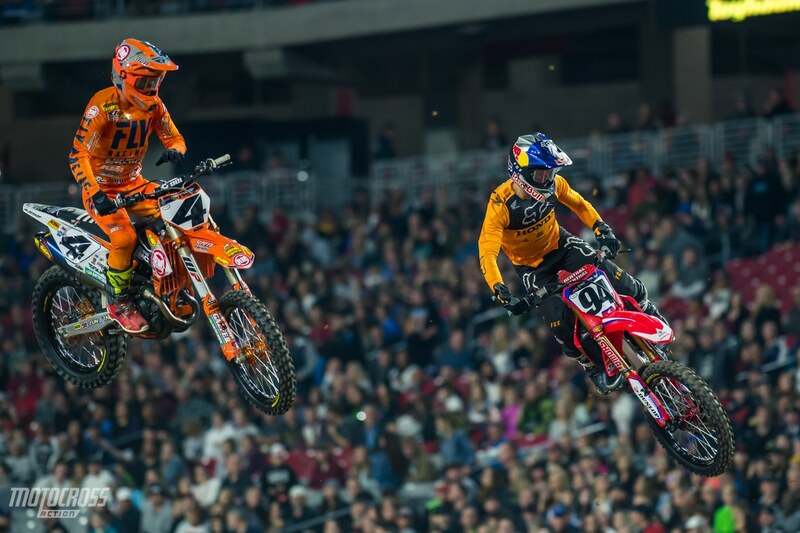 Blake battling with Ken Roczen in the heat race. In the main event Ken was taken out by Jason Anderson and Blake was able to pass him while Ken was on the ground. YOU HAD A PRETTY QUIET OFF SEASON AND STAYED TO YOURSELF IN FLORIDA. OBVIOUSLY, IT WORKED OUT WELL FOR YOU. Yes, I stayed away from all media, all everything. Nothing against you guys, but I stayed away from everybody. I did not do social medial or any of that, just went to work. I hired a new trainer who is working one-on-one with my riding coach, and we went to work. It did not show at round one, but hopefully by the end of this thing at round seventeen, it shows. 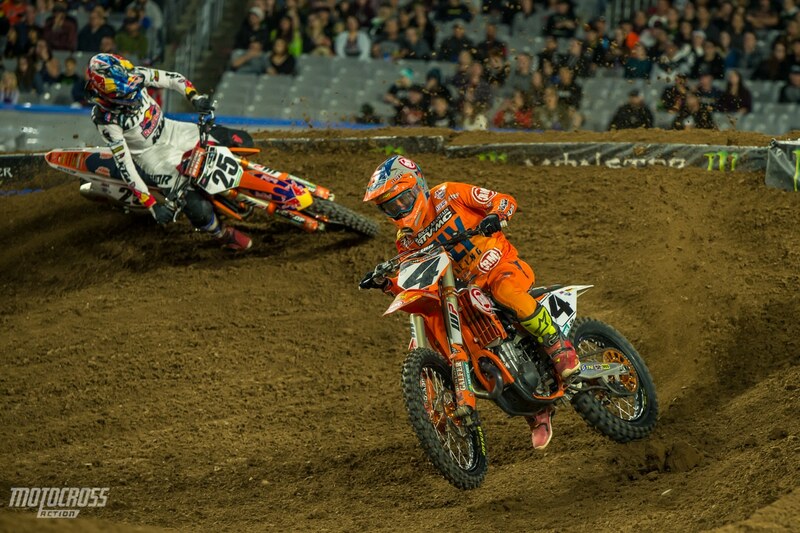 Blake passed Marvin Musquin on lap five to move himself into third right before the red flag came out. WRAPPING UP, ARE YOU READY TO KEEP IT GOING? Yes, for sure. This race is already over, and you have to move on and get ready for the next one. It is a long series, so, fifteen rounds to go.